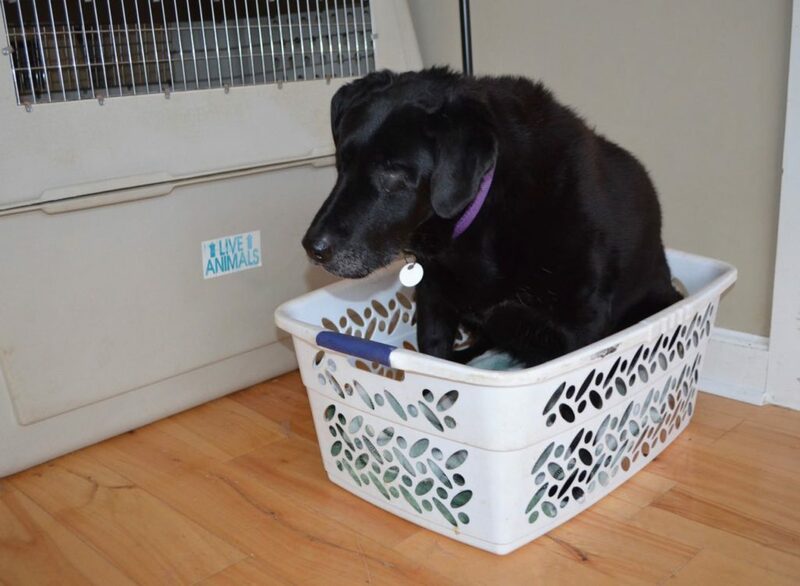 Yesterday after we let the dogs back in from their mid-day potty break outside, blind Allie the Lab wandered through the laundry room, came back into the dog room, and for some reason — the first time ever — decided to get?into the laundry basket (a.k.a. custom dog bed) by the door. Alayne watched her try to climb in and get herself turned around. To put it mildly, this was a rather awkward exercise of a large dog milling about in a small space. Alayne?went to get the camera. When she returned, Allie had settled herself in a stiff sitting position. 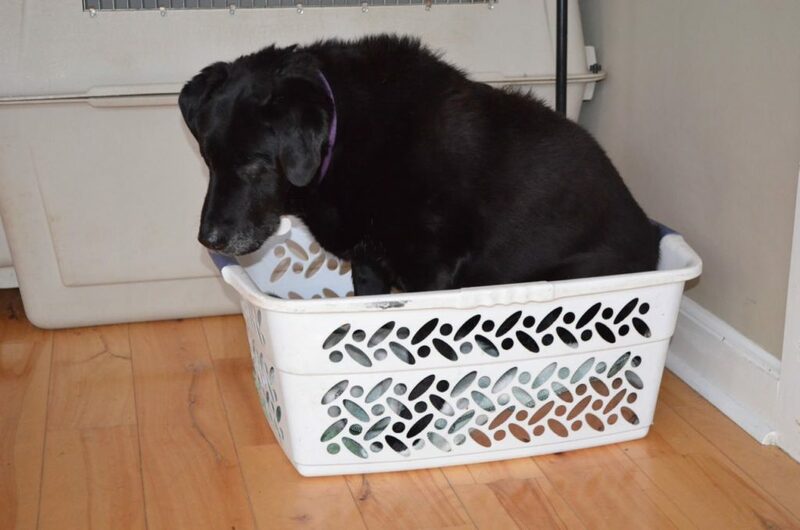 We’ve posted several photos of various dogs in that basket over the years, but I think Allie is probably the biggest dog to give it a go! In case you’re wondering, after a couple of minutes contemplating the physics of her situation, Allie abandoned the basket for more comfortable accommodations. Very cat-like behavior. Good for you, Allie – you never know when trying something new just might be the cat’s meow! Hey, we all need a change of scenery sometimes, even our blind friends- I guess Allie was just exploring a little bit. What a cute photo. LOL!!! Allie just thought I’m gonna find out what is the big deal with this basket that others seem to like. Try as she might guess it wasn’t so great after all for her. Awwww! I have a blind yorkie (11 years old – due to diabetes) and he is s patient and poky and will curl his 20-lb. self into the little dog’s pet bed and try to snooze. I think they feel cozy and safe! That’s so cute. Probably she has noticed that other dogs use it, and thought she should give it a try. Not being able to see it, she had to find out via actal testing that it wasn’t a good fit for her. She’s probably wondering what the others could possibly like about this cramped little bed. Need to get her a bigger basket! How old is Blind Allie now? Shirley, she’s at least 14 years old now. Silly pup! She probably just had to see what all the fuss was about with sleeping in that basket!